After a feisty discussion about cameraphones, a friend recently asked me: "Who shoots in 4:3 aspect anymore? Your phone's screen has a 16:9 aspect ratio, your computer's screen is 16:9, even your HDTV is 16:9. So what's the point?" Smartphone makers don't exactly encourage shooting in 4:3 either and many phones default to a 16:9 aspect ratio out of the box. But there is one little detail - cameraphone sensors, for the most part, are still manufactured in a native 4:3 aspect ratio. So if you're shooting in 16:9 mode, you're wasting precious megapixels. Today, we accidentally discovered that Sony has been working on a way of making that trade-off a bit less off-putting. To achieve this they've turned to an already existing solution to this problem - they've implemented a brand new, custom-built 25MP multi-aspect sensor inside their latest Z5-series phones. Sources from Japan refer to the Exmor RS sensor as the Sony IMX300, but we couldn’t verify that. The chip debuts on the just announced Xperia Z5 lineup and is paired with an f/2.0 24mm-equivalent wide-angle lens. Sony market these phones as having 23MP cameras as this is as high as the 4:3 aspect mode goes, but the real hidden gem is the extra high-res 16:9 aspect mode. While we were shooting the camera samples for our Sony Z-series hands-on article, we noticed a discrepancy between the horizontal and vertical size of the images produced in 16:9 and 4:3 aspect ratio. We dug in a little and we came to the obvious conclusion that the camera utilizes what’s become known as a 25MP multi-aspect sensor even though they are not advertising it. Photos shot in 4:3 aspect come out at the headline 23MP resolution, or 5,520 x 4,140 pixels (22.85MP, but who’s counting). Meanwhile, the 16:9 aspect ratio mode yields images measuring 5,984 x 3,366 pixels (20.14MP). What you’ll notice, is that the 16:9 shots have a higher horizontal resolution than the 4:3 ones, hence they’re not cropped from 4:3 as usual, but instead use a different part of a larger sensor. If you were to extract a 16:9 aspect photo from a supposed native 23MP 4:3 sensor (5,520 x 4,140px) by cropping, you’d be left with 5,520 x 3,105 pixels, or only 17.14MP. So the only way that the math works out in this case is if Sony is using an imager with an effective area of at least 5,984 x 4,140 pixels, or 24.77MP in other words. The concept means you get comparable resolution in both ratios. It's not a new concept by all means. Nokia first made it popular with its innovative 8.7MP camera sensor used as far back as the Nokia N9 (that was 2011 for the younger among you). 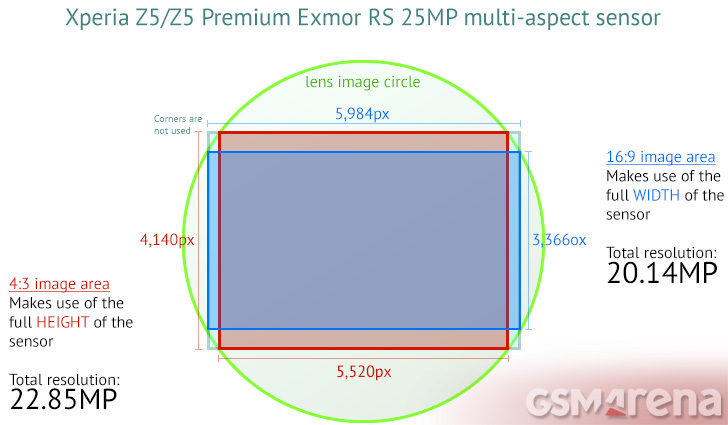 With the custom 25MP multi-aspect sensor implemented by Sony the 16:9 shooting mode benefits from capturing 3MP higher resolution while still having the same diagonal field of view, though with obviously wider horizontal coverage. Sony, naturally, went the obvious route and branded the camera as 23MP, choosing go keep the nitty-gritties to itself. If it were to announce a 25MP camera where users could only select a 23MP maximum resolution, we reckon marketing will have a lot to explain. OK, not a lot more than the above. While it may be way too technical for pitching in press releases, delivering 20MP 16:9 photos is just one of the surprising hardware advances we're witnessing in the new Z5 series. Indeed, with such high resolution shots, who would shoot 4:3 anymore? Hello. What is the pixel size of the sensor's pixels? And can't Sony and Nokia just use the full sensor resolution? That's better than matching those ugly standards. Both 4:3 and 16:9 can be extracted from it.